Some quick booze news for ya: ~JARDINIÈRE~ is hosting guest bartender Carolyn Alburger of Eater this Thursday August 18th from 6pm-8pm. She’ll be shaking the MargarEater ($9) behind the bar, and all money made from this cocktail purchase will be used to help support the charity Home Away From Homelessness. There will also be a cheese, corn, and chile empanada for $9. Arriba. ~BLUESTEM BRASSERIE~ has some “feel good” happy hour offerings Mon-Fri 4pm-6pm, featuring $5 One Hope wines by the glass, $5 well drinks, $3 select draught and bottled beers (Sierra Nevada, Trumer Pils, Lagunitas IPA, and more), as well as a $7 specialty cocktail, the Bluestem Smash (St-Germain, Stolichnaya Vodka or Evan Williams Whiskey, muddled seasonal fruit, mint, lime, and sparkling wine). And you can feel good about your boozin’, because $1 of every Bluestem Smash sold will go toward UCSF cancer research, and 50% of profits generated by One Hope wines are donated to partner charities (autism and breast cancer research). ~TXOKO~ has a new late-night happy hour (Tue-Thu after 10pm), with $2 PBR and $5 Fernet on Tuesdays, $5 glasses of wine and $5 Fernet on Wednesdays, and $3 draught beer (Trumer Pils, Ommegang BPA, and Anderson Valley Barney Flats Oatmeal Stout) and $5 Fernet on Thursdays. Yeah, dangerous. Since we’re in the 510, ~GATHER~ has also launched a new weekday happy hour, with food and beverage specials Mon-Fri 5pm-6:30pm. Guests can enjoy $4 tap beer, $5 tap wine, and a $15 market pizza. 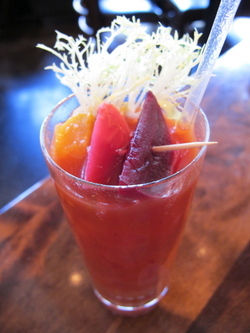 It’s bloody Mary time on August 28th when eight bartenders will compete for the winning recipe at Sunday, Bloody Sunday in the newly renovated ~BAR DRAKE~ in the Sir Francis Drake Hotel. Guests will get to sample the eight unique bloody Mary entries, plus brunch bites will be served to honor the debut of chef Jen Biesty’s new brunch menu, so you can line your stomach with, for example, the “Biestwich” BLT with crisp Llano Seco pork belly, avocado, vegetable aioli, and greens on a ciabatta bun. 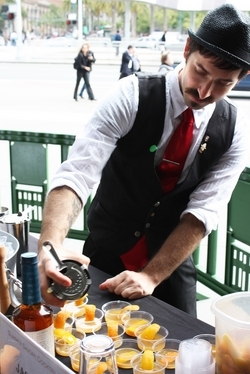 Which of these competitors will take home the title of “Best Bloody Mary”? Scott Baird, Bon Vivants; Bret Sylvester, Otis Lounge; Dan Smith, Good Gracious! Events; Jason “Buffalo” LoGrasso, Cotogna; Matthew Harrison, Delarosa; Oliver Lee, Four Seasons; Vincent Toscano, Rye; or Brian Deconinck, Scala’s Bistro? They’ll be using Square One Organic Spirits infused with cucumber, botanicals, or basil. The competition will run from 11am-1pm. The judges will decide the “Best Bloody Mary” while guests get to vote on the “Crowd Favorite.” Tickets are $10 in advance, $20 at the door, and include the brunch nibbles and all eight tastes. Proceeds benefit CUESA. 432 Powell St. at Sutter, 415-395-8555. Bartender Kyle Ford. Photo: © tablehopper.com. In case you missed the mention last week, the Center for Urban Education About Sustainable Agriculture (CUESA) and the Northern California Chapter of the United States Bartenders Guild (USBG) are hosting an ~SF COCKTAIL WEEK PREVIEW PARTY~ featuring cocktails straight from the farmers’ market. It’s Wednesday August 24th, 5:30pm-8pm, in the CUESA Kitchen in the Ferry Building. The 20-plus bartenders who will be keeping this happy hour happy include Summer-Jane Bell, Jessica Maria, and Keli Rivers of Hotsy Totsy Club; Lou Bustamante, Northern California USBG Treasurer; Victoria D’Amato-Moran of Cent’Anni Cocktails; Kevin Diedrich of Jasper’s Corner Tap; Reza Esmaili of Ananas; Brandon Josie of 15 Romolo; Greg Lindgren of Rye; Duggan McDonnell of Cantina; David Nepove, USBG National President; Jacqueline Patterson, National Brand Ambassador for Solerno Blood Orange Liqueur; Jennifer Seidman of Acme Bar and Co.; and Ethan Terry of 15 Romolo. These are the good folks bringing you the programs and parties of SF Cocktail Week too, by the way. They’ll be mixing up two full-sized signature cocktails for ya with Oxley Gin and Corzo Tequila, plus 14 cocktail sips using summer’s best produce—peaches, plums, pluots, blackberries, peppers, fennel, heirloom apples and tomatoes, etc.—and the spirits sponsoring SF Cocktail Week—Belvedere Bloody Mary Vodka, Brugal Rum, Campari, Charbay Tahitian Vanilla Vodka, a variety of Cognacs, Cointreau Orange Liqueur, Hangar One Vodka, Herradura Tequila, The King’s Ginger Liqueur, Michael Collins 10 Year Old Single Malt, No. 209 Gin, St. George Spirits’ Gin, Solerno Blood Orange Liqueur, and Templeton Rye Whiskey. If your liver is aquiver at the thought of all that alcohol, just remember, they will be serving bites from local restaurants. You’ll also get to vote for your favorite drink and hors d’oeuvre, and five voters will win advance tickets to SF Cocktail Week events. Good luck! Ticket are $45 online, with proceeds going towards CUESA’s Schoolyard to Market program, a youth development and entrepreneurship program in which local high school students grow produce in school gardens to sell at the Ferry Plaza Farmers Market.